Clearly we are heading into the beautiful “season” that is Autumn! 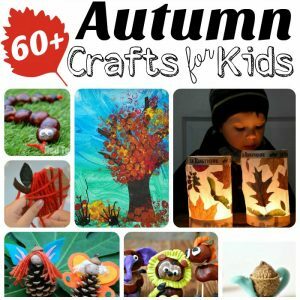 We love Autumn Crafts for Kids. I have many fond memories of crafting at this time of year when I was a child. I particularly enjoyed crafting with nature finds – such as conkers or acorns – but also enjoying all the leaves you could collect – the different shapes and colours. 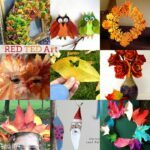 All those warm reds, oranges and yellows, make for beautifully firey Autumn Crafts. 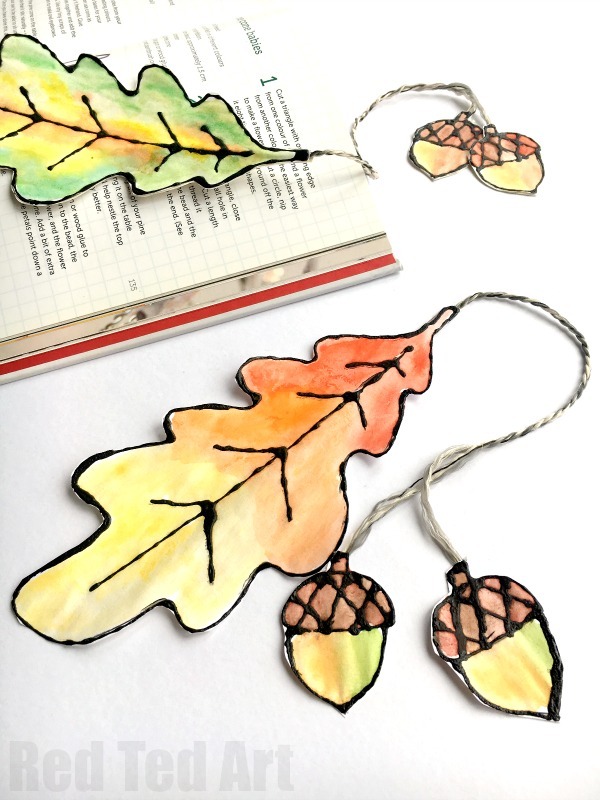 Today’s Leaf Bookmark is inspired by said nature finds – Oak Leaves and Acorns. 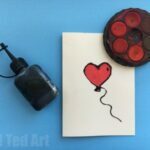 They combine a wonderful “Black Glue & Water Colour technique” (learn how to make Black Glue here) and the results are just stunning. 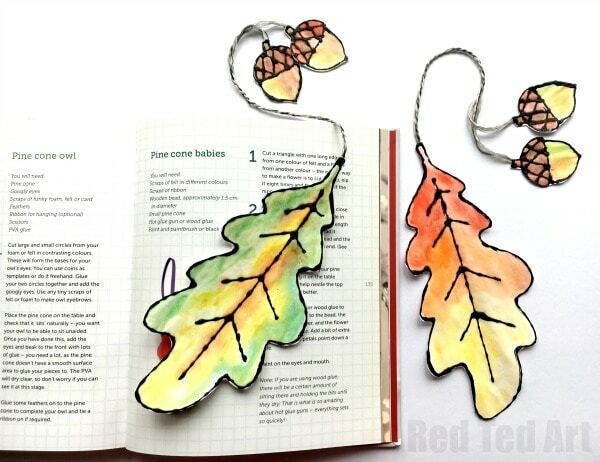 Lovely little Watercolour Leaf Bookmarks for your favourite book or make them as gifts to a friends or teachers. 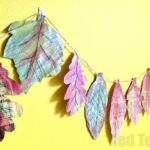 I have included an Oak Leaf printable for you, however.. you could go out and find your own oakleaves and trace them to make this a truly unique leaf bookmark DIY. 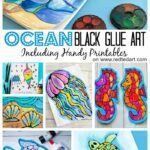 If you fancy more Black Glue projects – we have a fantastic set of Under the Sea Black Glue Project ideas (including free templates!) 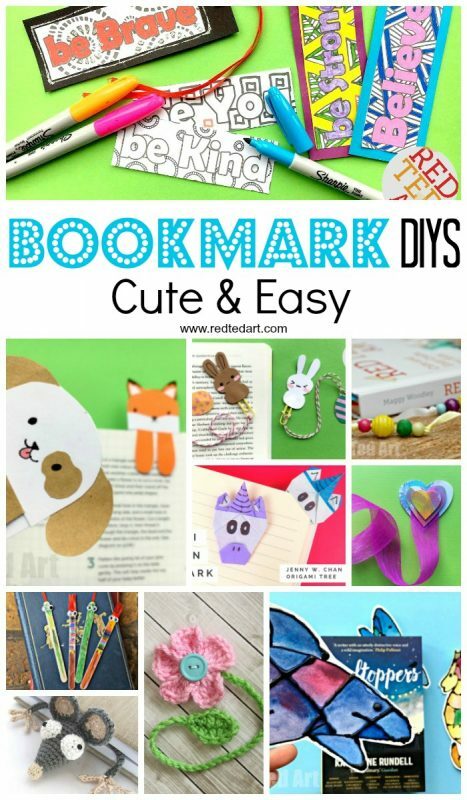 and many more great DIY Bookmark Ideas for you to browse. 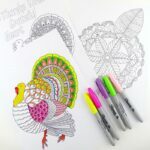 If you want to try out different shaped leaves.. head over to my friend’s site Rhythms of Play for more leaf printables! It is important to let your glue dry FULLY before using your watercolours! 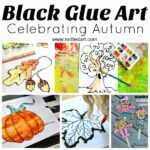 To make your Black Glue Leaf Art Bookmarks, start off by printing off your FREE Oak Leaf Bookmark printable. I have designed it that you can get two bookmarks per sheet of paper. You may wish to print straight onto cardstock. 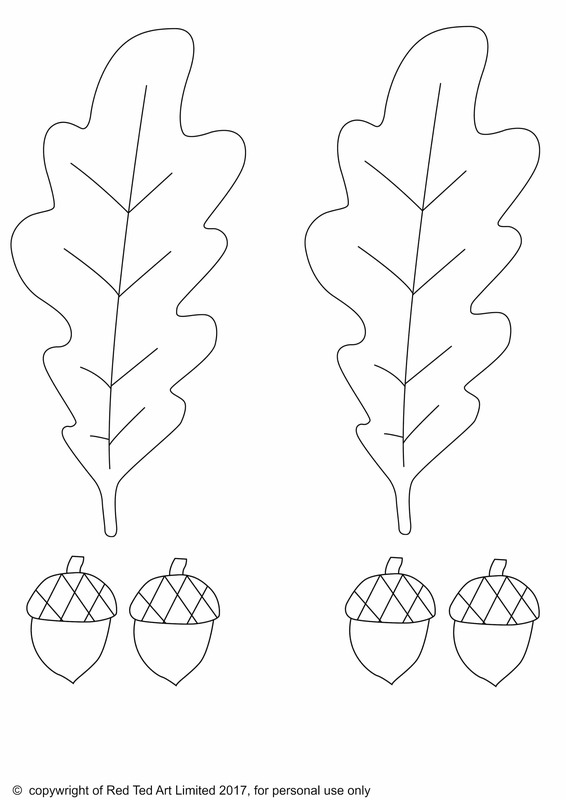 If you do not have a printer, find an Oak leaf in nature… and trace it. 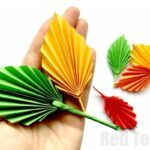 This will give you are really unique looking bookmark -note, it is likely to be a little smaller than the ones made here today. 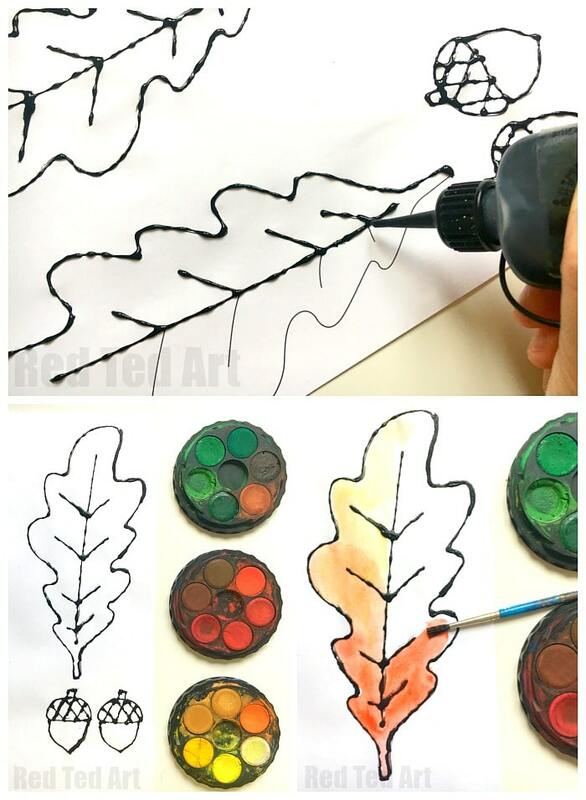 Careful apply your black glue to your leaf outlines – check out the black glue art tips shared above for best results. Once FULLY dry, you can get your watercolours out. Be brave, explore and have fun with your water colours – mix reds, oranges and yellows, as well as greends, yellows and oranges. For the acorns, I mixed browns ands reds and browns and greens. Once your black glue and watercolour leaves are painted, let dry fully. 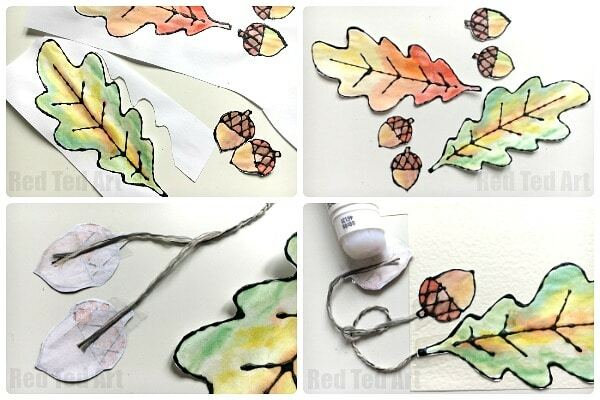 Then carefully cut out your watercolour leaves and acorns. I used bakers twine to connect my acorns to my leaf bookmark. I unravelled one end slightly, so I could tape on the two acorns. Don’t worry if the tape overlaps, you can trim it aftwards. For a neat finish and to strength my acorn and leaf bookmarks, I now glued the leaves and acorns down onto some light card. This will hide the tape as well. 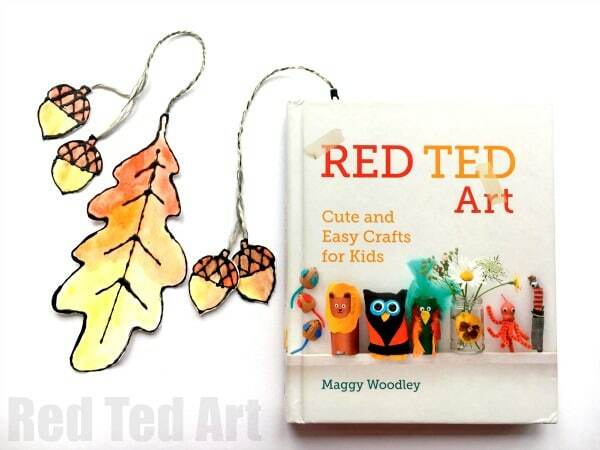 Again, cut out your watercolour leaves and acorns and your lovely black glue leaf bookmarks are FINISHED! Thanks for the air bubble tip – I needed that! 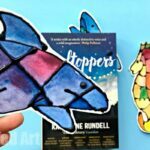 Love the bookmarks ? Thank you!! And so pleased the tips are useful too!